I found this via NotCot and I fall in love instantly. I can't care less if some call it a "nerdy" object. 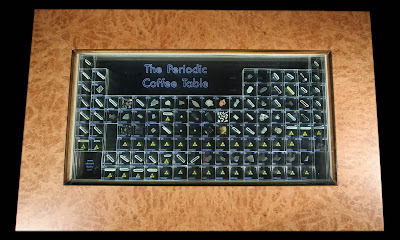 It is a periodic table converted into... a real coffee table! 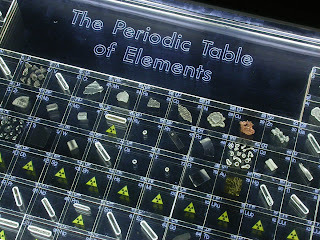 But what I find absolutely charming is the fact that it has samples of each element, embedded in solid acrylic blocks. According to the company offering the table, "By embedding all element samples in clear acrylic, they are beautifully presented and also protected from tarnishing. This format also helps to addresses health and safety issues, as all potentially toxic or corrosive substances are permanently encased in a thick layer of robust resin. Argon gas and mineral oil is further used to ampoule reactive samples and preserve their freshly cut appearance." Of course is not cheap (£4,750 what means around U$ 9000). But come on, you have a samples IN your coffee table... how many people can say that? And from the practical point of view, if you ever decide to kill someone you have a couple of poisonous things right there, at hand. Last but not least, once the acrylic blocks are arranged in the right order, the grid is carefully illuminated and beautifully presented beneath a sheet of toughened glass while the table itself is created by British Craftsmen using burred oak. And individual acrylic blocks are available for sale (I guess as a replacement if needed), although as they explain "...some elements are costly to send internationally." It just made my wish list. I still can't see anything nerdy about this object but I guess that's me. That is extrodinary! Witty, useful and beautiful...form, function and FUN!